in music, shift in the key center of a composition. For its accomplishment use is made of the fact that each chord figures in the harmonic relationships of several keys. , in music, systematic avoidance of harmonic or melodic reference to tonal centers (see key). The term is used to designate a method of composition in which the composer has deliberately rejected the principle of tonality. ..... Click the link for more information. . The concept of keynotes was developed gradually during the 16th and 17th cent. and its partial or total abandonment was a feature of the modernism of the early and mid-20th cent. Polytonality, the employment of two or more keys simultaneously, has been used by some 20th-century composers. 2 Also in music, in reference to musical instruments the term key refers to a lever depressed by the player's finger or, in the case of the pedal keyboard of the organ, the foot. In woodwind instruments the keys control covers on the holes that shorten the vibrating column of air. In brass winds they control the valves that lower the pitch of the instrument by lengthening the tube. fastening fitted to an entryway, such as a gate or door, or a container, such as a cabinet, drawer or safe, to keep it closed and/or prevent unauthorized access or use. A tapered or wedge-shaped piece that locks pieces of timber together. What does it mean when you dream about a key? Keys can symbolize having a secret. They can also represent “locking away” one’s inner feelings. The holder of the key has the power to unlock whatever the dreamer needs. Plastering that is forced between laths to secure the rest of the plaster in place. The roughening on a surface to be glued or plastered to increase adhesiveness. A projecting portion that serves to prevent movement of parts at a construction joint. A data item that serves to uniquely identify a data record. An instrument that is inserted into a lock to operate the bolt. A device used to move in some manner in order to secure or tighten. One of the levers of a keyboard. A hand-operated switch used for transmitting code signals. Also known as signaling key. A special lever-type switch used for opening or closing a circuit only as long as the handle is depressed. Also known as switching key. The pieces of core causing a block in a core barrel, the removal of which allows the rest of the core in the barrel to slide out. A cay, especially one of the islets off the south of Florida. Also spelled kay. A hooklike wrench fitted to the square of a sucker rod to pull and run each sucker rod of a pumping oil well. An arrangement of the distinguishing features of a taxonomic group to serve as a guide for establishing relationships and names of unidentified members of the group. 1. A wedge which passes through a hole in a projecting tenon to secure its hold. 2. 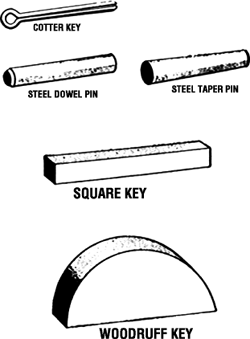 A piece of metal or wood which is inserted in a joint to prevent movement between adjacent surfaces. 3. A piece inserted in the back of a board to prevent warping. 4. The last board in a series of floorboards, tapering in shape, and serving to hold the others in place when driven home. 5. The property of a material that facilitates the bonding of another material to it. 6. The roughening on the underside of veneer or similar material to assist it in holding glue. 7. The roughened surface on the back of tile or the like to assist it in holding mortar. 8. In plastering or similar work, that part of the plastic material that is forced between and enters the holes in (or clings to the roughened surface of) the backing lath. 10. A groove cut in a surface into which fits a corresponding projection from a member above, as a keyed footing. 11. A detachable metal instrument which operates a lock; it is inserted into the lock and moves a bolt, latch, or catch. 2. any instrument that is rotated to operate a valve, clock winding mechanism, etc. 4. any of a set of levers operating a typewriter, computer, etc. A value used to identify a record in a database, derived by applying some fixed function to the record. The key is often simply one of the fields (a column if the database is considered as a table with records being rows, see "key field"). Alternatively the key may be obtained by applying some function, e.g. a hash function, to one or more of the fields. The set of keys for all records forms an index. Multiple indexes may be built for one database depending on how it is to be searched. A value which must be fed into the algorithm used to decode an encrypted message in order to reproduce the original plain text. Some encryption schemes use the same (secret) key to encrypt and decrypt a message, but public key encryption uses a "private" (secret) key and a "public" key which is known by all parties. (1) A wireless charging system. See Qi wireless charging. (2) A keyboard button. See QWERTY keyboard. (2) A numeric code that is used with an encryption algorithm to encrypt text for security purposes. See key length, key space, cryptography and salt. (3) An essential field in a database record. See key field and sort key. As with most dreams, look for the obvious connections by comparing the details or the theme of your dream to your daily life. Are you trying to figure something out and “unlock” a puzzling question? Do you wish to hide something? Are you locking something up or are you opening the door? Last, but not least, does this dream have any sexual connotations?